This is good news for Cricket IPL lovers who do not subscribed premium DTH and Cable TV platform. Because now you can enjoy IPL Cricket matches on Doordarshan Network. But for your information, we want to update that you will not watch live cricket, there will be delay of 1 hour. You can enjoy minute to minute live feed on Star Sports network. Yesterday Prasar Bharati publicly informed by official twitter handle that Star Sports Network agree to share IPL Cricket feed for select matches on a one hour deferred live basis with 50-50 revenue sharing. When Vivo IPL 2018 starting? 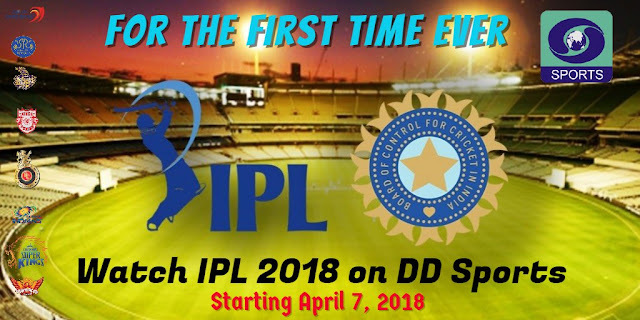 You can watch Vivo IPL 2018 cricket match from 7th April 2018 on DD Sports channel. Where you can watch IPL Cricket Free? You can watch IPL Cricket Free on Doordarshan Network channel at "DD Sports" but selected matches will be available. How you can get DD Sport? You can watch DD Sports channel on DTT (DVB-T2) platform which can be access on mobile, cars and television. You can also enjoy IPL Matches on if you have installed India's free to air DTH service called "DD Freedish". Although at this time you can enjoy all the LIVE action of Common Wealth Games 2018 on DD Sports channel.